Middle-market purchase price multiples in the US have nearly doubled since 2009, per our 3Q 2018 US PE Middle Market Report. To be sure, most metrics and indicators have bounced back substantially from the crisis, and private equity is no exception. 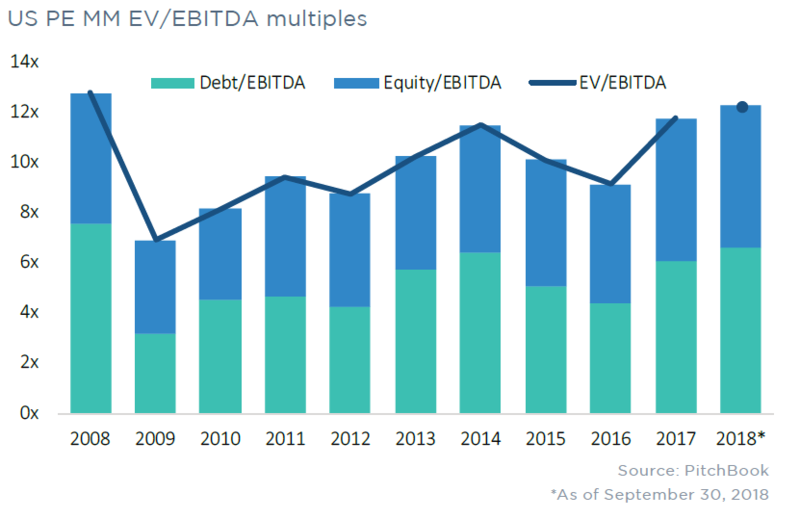 PE valuations have risen moderately from year to year, sometimes in fits and starts, and now stand close to where they were in the halcyon days of 2008. To call attention to pre-crisis similarities often implies a feeling of déjà vu, that another downturn is around the corner. For private equity, however, most crisis-era problems were concentrated at the highest end of the market—the multibillion-dollar deals for companies that would eventually be caught flat-footed by energy prices, changing consumer behaviors or burdensome debt. Investors are more modest today—at least they say they are. Yet multiples have catapulted back to pre-crisis levels. The middle market is somewhat of a unique case, in that investor enthusiasm at this end of the market is much more palpable today than it was 10 years ago. Through 3Q 2018, combined deal value in the middle market is nearly $312 billion—almost double the $169 billion deal value of 2008. With most of a quarter left to go, the US middle market is almost assured of record numbers for both deal volume and dollars. The optimism is understandable—middle-market companies have more runway in terms of revenue growth and geographic expansion versus their blue-chip peers. But paying a 12x multiple at entry requires some pretty aggressive exit assumptions, especially when interest rates are expected to be visibly higher in four to six years. Investors are confident at the moment—add-ons help boost earnings and help blend down the multiples paid for the original platform, so 12x could turn into 10x over time. Meanwhile, the recent fundraising surge has provided the resources PEGs need to out-compete each other at every auction. Price tags have ballooned as a result, with no end in sight at the moment. High entry prices are a given today, but many investors may have modified their assumptions based on the current environment. And should another significant correction be lurking around the corner, it may be the middle market that absorbs most of the pain the next time around. This column originally appeared in The Lead Left.